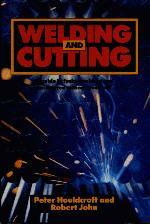 This authoritative reference thoroughly covers every aspect of thermal welding and associated cutting processes. It is essential reading for welding and production engineers, and students, as well as anyone associated with the selection and application of equipment and consumables. Offers a structured reference work for those associated with the selection and application of materials and equipment for welding an d cutting. Starts with a review of the basic principles of arc welding. Logically progresses to cover more involved descriptions of the latest techniques, such as the use of lasers and robots. Includes a note on sources of information and a list of reference works for those who require further detail on technical descriptions. Principles of Arc Welding. Procedures for Specified Materials. The Manual Metal Arc Process. The MIG Process. Cored Wire Welding. Submerged-Arc and Electro-Slag Welding. TIG and Plasma Arc Processes. Gas Welding and Cutting with Power Beams. Robots for Arc Welding. Welding Productivity. Appendices. Index.